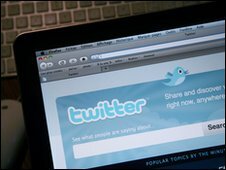 Twitter has said it will allow advertising on its site for the first time. The social networking site said advertisers would be able to buy "Promoted Tweets" that will appear on Twitter's search results pages. It has been reluctant to allow advertising in the past. 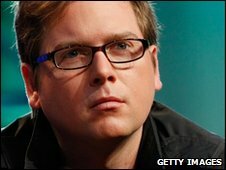 However, co-founder Biz Stone said they would not be traditional adverts. They must be Tweets that "resonate with users" and be part of conversations. Twitter has already signed up a raft of big name organisations such as Sony Pictures, coffee chain Starbucks and US retailer Best Buy. Twitter is yet another digital business in search of a business model. Tweeting may still be a minority sport in most countries, but it is growing fast, especially internationally. Currently, the world's Twitter users tweet about 50 million times a day 600 times a second. Twitter's management hopes to apply the Google advertising model to its own micro-blogging service. A paid Tweet here, a paid Tweet there, and the deluge of the Twitterfall should deliver some healthy income. Companies using the service, however, will be looking closely at the return on investment that the service will generate. Should they pay per tweet read, per click-through, or per sale-after-click? Commercial tweets to build brands and create buzz are probably the most promising application of Twitter ads. For ad copy writers, it will present a new challenge: how to hook customers with 140 characters or less. It describes the Promoted Tweets as "ordinary Tweets that businesses and organisations want to highlight to a wider group of users". Initially, Promoted Tweets would only appear in Twitter search results, the company said, and only one Tweet would show up on each search results page. It is the first toe in the advertising water for the social networking site, which has yet to make a profit and has only just begun to do deals to raise revenue from the high profile service. It is an approach that the company described as a "stubborn insistence on a slow and thoughtful approach to monetization". It follows Twitter's announcement over the weekend that it will buy Atebits, the developer behind iPhone application "Tweetie", which is one of the main user access points to Twitter. The acquisition means that Twitter will for the first time be able to control directly the service they deliver to iPhone users, instead of relying on third party application developers to do this for them. However, analysts say it also means that Twitter is turning the remaining application developers that it has worked with in the past into direct competitors. This raises the possibility that if Promoted Tweets prove unpopular with users, rival application developers may offer products that filter them out. "There is a risk that users may get turned off by too much advertising," says Christine Overby, vice president of interactive marketing at research company Forrester. "But I think this risk is easy to manage - they can look at how Google for example has handled this." However, Ms Overby thinks there is another risk in Twitter's plans to pay advertisers based on a "pay for resonance" model, which they will calculate using various measures of user response to Promoted Tweets. "Advertisers are accustomed to 'pay per click' or 'pay per thousand' [advertising units] models," she adds. "They may not appreciate this model - there will certainly be a discussion as to what the 'pay for resonance' model actually is." The advertising and Tweetie moves are not the first revenue-raising initiatives by Twitter - in October the company announced tie-ups with Google and Microsoft's Bing under which the two search engines pay Twitter to include Tweets in their search results. Twitter's latest initiative is the first phase of its advertising plans. In future, Promoted Tweets will appear in users' stream of posts, not just on Twitter search results pages. Keen not to alienate his members, Biz Stone said that if users did not interact with Promoted Tweets by replying to them, "favoriting" them or retweeting them, they would "disappear". Unsurprisingly, Promoted Tweets soon appeared as one of the most talked about topics on Twitter. One user, brigidhaywood, said this was "big, exciting news" and she was curious to see how the concept would evolve. However, Xenon_360, said: "If Sony Pictures starts advertising on Twitter, I'm out." Could you get by without Twitter?